2019 – 04/04 Self-employed? A key deadline is approaching. 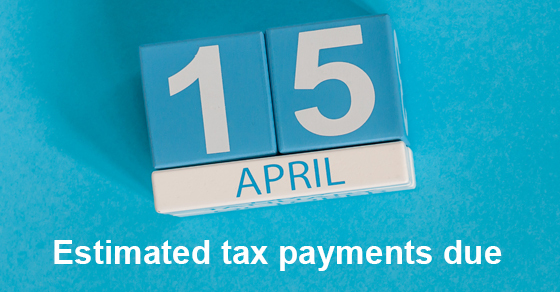 The IRS is reminding self-employed individuals, retirees, investors and others who pay their taxes quarterly that the first estimated tax payment for tax year 2019 is due 4/15/19 for most of these taxpayers. The Tax Cuts and Jobs Act changed the way tax is calculated for most taxpayers. This includes those with substantial income that isn’t subject to withholding. So, you may need to raise or lower your quarterly estimated tax payments. Contact us for advice about your situation or visit https://bit.ly/2UCnn7n.